The NWS Wind Chill Temperature Index uses advances in science, technology and computer modeling to provide an accurate, understandable and useful formula for calculating the dangers from winter winds and freezing temperatures. Calculates wind speed at an average height of 5 feet, the typical height of an adult human face, based on readings from the national standard height of 33 feet, the typical height of an anemometer. Is based on a human face model. Incorporates modern heat transfer theory, based on heat loss from the body to its surroundings during cold and breezy/windy days. Lowers the calm wind threshold to 3 mph. Uses a consistent standard for skin tissue resistance. Assumes no impact from the sun (clear night sky). 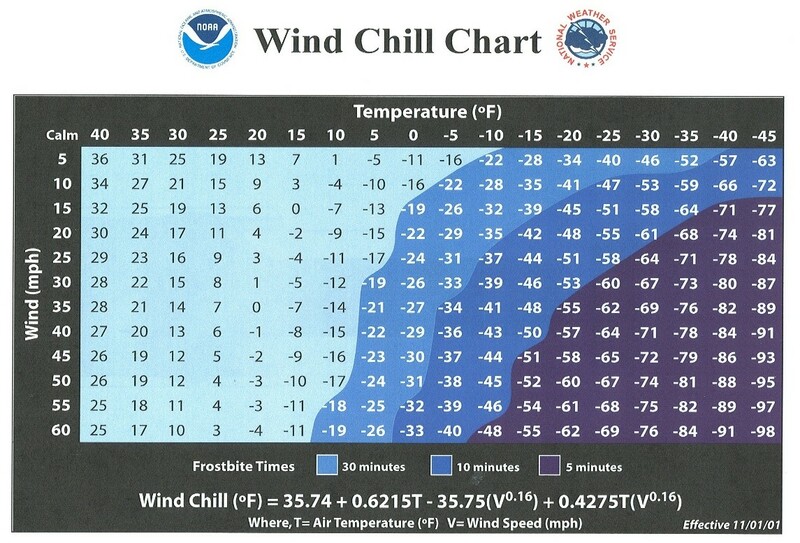 Wind chill temperature is only defined for temperatures at or below 50˚F and wind speeds above 3 mph. Bright sunshine may increase the wind chill temperature by 10˚F to 18˚F. The wind chill temperature is how cold people and animals feel when outside. Wind chill is based on the rate of heat loss from exposed skin caused by wind and cold. As the wind increases, it draws heat from the body, driving down skin temperature and eventually the internal body temperature. Therefore, the wind makes it FEEL much colder. If the temperature is 0˚F and the wind is blowing at 15 mph, the wind chill is -19˚F. At this wind chill temperature, exposed skin can freeze in 30 minutes. Hypothermia occurs when body temperature falls below 95˚F. Determine your temperature with a thermometer. Warning signs include uncontrollable shivering, memory loss, disorientation, incoherence, slurred speech, drowsiness and exhaustion. Get medical attention immediately. If you can't get help quickly, begin warming the body slowly. Warm the body core first, not the extremities. Warming extremities first drives the cold blood to the heart and can cause the body temperature to drop further--which may lead to heart failure. Do not give the person alcohol, drugs, coffee, or any hot beverage or food. Warm broth and food is better. About 20 percent of cold related deaths occur in the home. Young children under the age of two and the elderly (those more than 65 years old), are most susceptible to hypothermia. Hypothermia can set in over a period of time. Keep the thermostat above 69˚F, wear warm clothing, eat food for warmth, and drink plenty of water or fluids other than alcohol and caffeine to keep hydrated. Avoid alcohol because it will lower your body temperature.